Lily & Honglei Art Studio’s augmented reality artworks “Crystal Coffin” and “Dragon’s Pearl” on view at at both Longlake Festival & LAC Lugano Arte e Cultura, Switzerland, Opening June 24, 2016. We’re so honored and pleased to join NYFA Fellows this year. Under the category of Interdisciplinary Work, our portfolio comprises of multimedia projects that utilize VR, AR and video installations reflecting on the complex reality in China and its global implication. The New York Foundation for the Arts has announced the recipients of their 2015 Artists’ Fellowships. Awarded since 1985, the fellowships are reserved for artists living in New York state and are given out as unrestricted cash grants of $7,000 across fifteen categories over the course of three years. The current round of fellowships were given out in the areas of fiction, folk/traditional arts, interdisciplinary work, painting, and video/film. Recipients include Jaimie Warren and Molly Lowe in the interdisciplinary category, while Kalup Linzy and Eve Sussman are fellows in the video/film area. For a complete list of fellowship recipients, see the NYFA website. 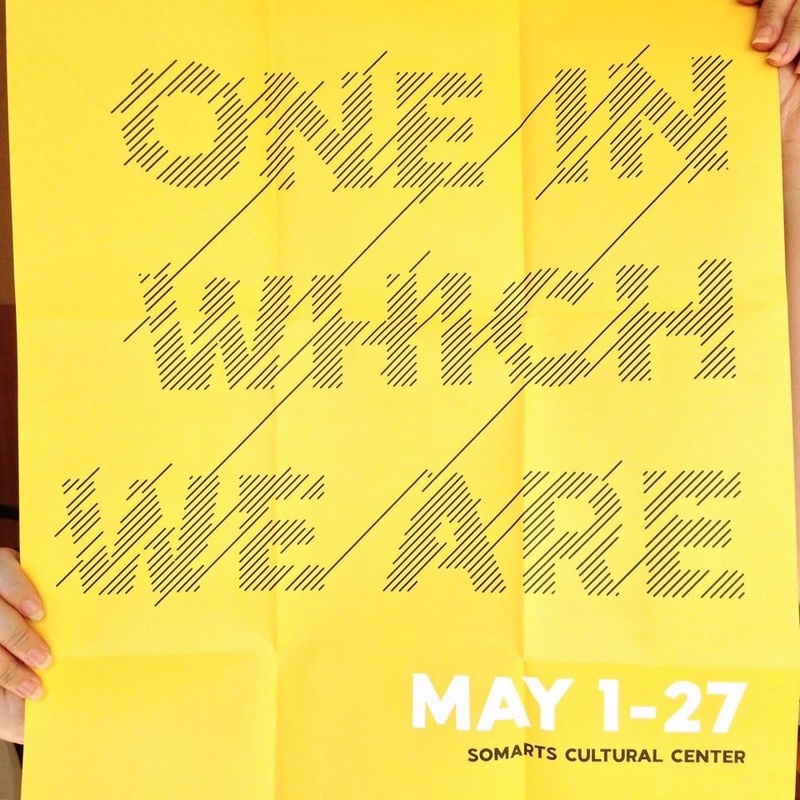 When: Exhibition on view May 1–27, 2015. Free admission during gallery hours: Tuesday–Friday, 12–7pm and Saturday, 12–5pm. Opening reception May 1, 7–10pm. As part of the 18th Annual United States of Asian America Festival: Sparking Light, and with the support of the Asian Pacific Islander Cultural Center, ONE IN WHICH WE ARE is a visual arts exhibition which explores the complex interdependencies between structures, processes, events, and the collective individual. Conceived as a relational map of reflections and experiences, this group exhibition brings forth inquiries surrounding individual positionalities and collective responsibilities. Through video works, painting, sculpture, photography and performance, these artists from the Bay Area and beyond explore personal and social wounds as collective attachments from where we may interpret and embrace our daily lives. The opening event on Friday, May 1, 7–10pm opens with a special performance by NAKA Dance Theater, The Anastasio Project. Click here to read about this performance. These virtual digital works are hidden from the naked eye but visible to anyone with an iPhone, Android or Nokia smartphone and an app called the Layar Reality Browser, that can be downloaded for free from iTunes, the Android Market or the Ovi Store. If you want to create your own mobile augmented reality art, click on the DIY link at the top of this same site for some tips to get you started and some ideas about other directions to take your work. This week, we’re bringing you a profile on He Li, a sophomore in TD. Tell us about yourself: I was born in Beijing, China, and I moved to the United States when I was eight years old. I’ve spent most of my time here in Queens, New York. If I had to pick, ancient history, American music, and old cars are probably my greatest passions in life other than painting. Influences: Writings by the likes of Cicero, St. Augustine, and St. Jerome have had immeasurable influence on the way I think. Other than these philosophical influences, artists of the Early Renaissance and 20th Century Modernist period are probably my greatest inspirations. My favorites are Piero della Francesca, Vittore Carpaccio, and Jan van Eyck. More recent painters such as Edward Hopper and Giorgio de Chirico have been crucial to the formation of my pieces too. I think there is a kind of otherworldliness that is common to the works of all I’ve just mentioned. How would you describe the focus of your work? : Above all else, my focus in art is to capture a certain essence. I can’t describe this essence in writing, because I would be a writer if I could do so. I have experienced some success, however, in infusing it into my paintings. If I had to choose a word to describe it, I would call it “divine,” since it does not seem to correspond to anything in our mundane day-­to-­day existence. Cicero wrote that one should always fix his eyes upon the stars rather than the Earth, since all human affairs are ephemeral. I am quite convinced that he feels the same kind of essence that I am referring to. I intend to express this essence through Midcentury Golden Age American imagery, since I grew up among the ruins of this bygone time. You can find more of He’s work here!